In last week's post, we mentioned MEXT's massive update to their 学習指導要領 (gakushuu shidou youryou, "curriculum guidelines"), already in place in elementary schools since April, 2011 and scheduled to roll out in junior high schools and high schools in April, 2012 and April, 2013, respectively. These guidelines define what must be covered in textbooks, so let's take a look at the new changes before we delve into the new editions themselves. (And if you teach in Japan but don't know what these guidelines are, you probably should.) So here we go! This update is the first time since the 1980s that MEXT is making education in Japan more rigorous. 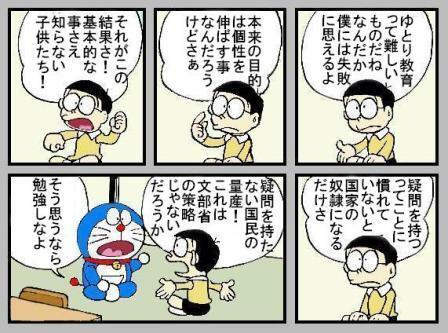 It's a response to recent criticism about ゆとり教育 (yutori kyouiku), a policy MEXT put in place due to violence and suicide in schools in the 70s. Education policies of the time were deemed too hard on kids, and so MEXT told schools to back off and let students develop more personality, take more elective courses, and do more extracurriculars. For the next 30 years (the curriculum guideline updates are made roughly every decade), MEXT continued to ease off, requiring less and less of schools and students each school year, until finally a new complaint emerged: From junior highs to universities, teachers across the board were complaining that students weren't performing as well as the (put on your rose-colored glasses here) motivated and studious Japanese of the bubble years. Test scores were down, and ゆとり教育 took the blame. So this round MEXT decided to step things back up. Students will be expected to spend about 10% more time in the classroom studying core subjects: Japanese, Social Studies, Math, Science, Foreign Language, and Health/Physical Education. And new emphasis is being placed on students' ability to communicate: MEXT wants Japanese students to be able to explain, criticize, and debate topics they study. Also notable is elimination of はどめ規定 (hadome kitei). In previous guidelines published by MEXT, extremely specific and limiting instructions were given to teachers. For example, in 小6 science classes, MEXT wrote that teachers should "not mention the food chain," and in 中3 math classes, MEXT stated that teachers should mention to students that unfactorable quadratics can still be solved using other methods but not spend any time teaching or practicing those methods. The idea was to standardize education, ensuring that all children across Japan are learning exactly the same thing, but at some point these precise instructions had just replaced common-sense advice: "Don't go over the students' heads." Teachers and schools complained about how limiting and unrealistic these はどめ規定 are, and MEXT listened, cutting them out from the 2011-2013 update. In regards to English, a big change is implementation of foreign language education in primary education, with a focus on speaking and listening. English is still not an official subject in elementary schools*. (The officials are Japanese, Social Studies, Arithmetic, Science, Life Environment Studies**, Music, Drawing, Home Economics, and Physical Education.) But schools are now required to give foreign language regularly scheduled time in their calendars. It ranks alongside annual school events and periodic classes like 道徳 (dotoku, "moral education") and 総合 (sougou, "synthesis"), the latter of which is a loosely defined time that can be used to prepare for school festivals or listen to a guest speaker. 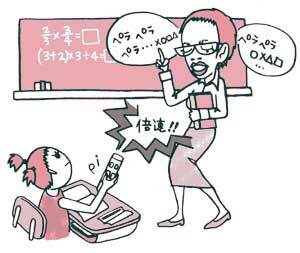 In fact, the more loosely scheduled English classes held in schools prior to 2011 were making use of 総合 time. In junior high and high school, expectations are becoming more rigorous. In the three years of junior high education, for example, students will be expected to obtain a vocabulary of 1200 words, whereas previous guidelines required 900. Next time, we'll take a look at the new textbooks and see what has changed in them since older editions. We'll draw some comparisons between the current editions put out by the different publishers as well. Stay tuned on Facebook and Twitter, and we'll let you know when they are up! *Neither was foreign language an official subject in junior high, by the way. From its establishment in 1947 until the 2002 guideline update, it was ostensibly an elective. **Life Environment Studies is a subject taught to first and second grade elementary school students, implemented since 1992 to help first and second graders to "distinguish occurrences around them as natural phenomena or social phenomena." It seems like a roundabout way to say "spend time in class helping them become more Japanese," but the class activities alternatively have the students out in local parks looking at plants, animals, and insects and in shops or public venues like cultural centers "helping out" by performing some kind of simple task.